This photo was taken on April 9, 2015 at 7:04 AM. The location was in front of a very large Hotel in Washington DC on Capital Hill. The "Take It!" came after taking a broad step to get over a large puddle that was next to the curb, after having parked my car. 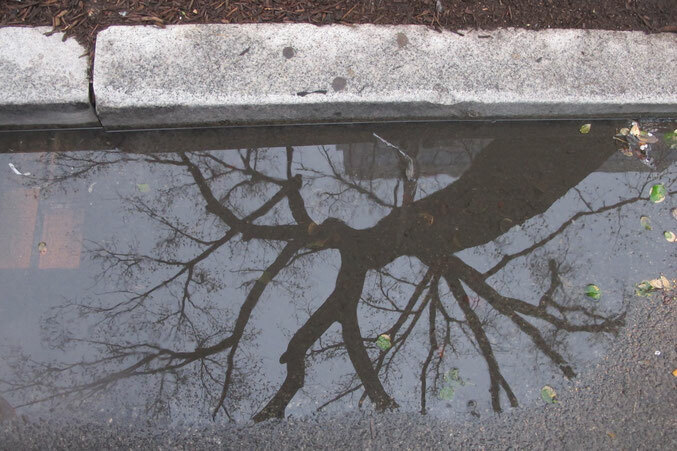 Midway through the long step - I happened to look down at the puddle and saw the reflection of the overhead tree on the surface. The match up of that part of the shape of the structure of the tree with the puddle just seemed to be conducive to my stepping back and taking this photo. The After Take: To those who looked at the photo - all seemed to enjoy the fun of it and my expression of surprise in seeing this image as I made my way over the puddle. The inclusion of the curb leaves little question as to the explanation. Please join me in being a puddle watcher - for not only can you contribute to your safety - but who knows what you will find in there - lol. You can see little buds on the tree. Winter is officially over! Crystal clear, looks like glass. It almost looks like the roots can be seen... The reflection really gives off that look. Was this located near the Capitol building? Not only were you able to stay dry but you caught a glimpse into this wonderful mirror. I bet its full of leaves now. I would loved to see the same shot after a summer shower showing this tree in the same way with full leaves. What a fun picture. This had to be a fun one to discover!